(1) Lopez de Bertodano, M, Lahey, R.T. and Jones, O.C., "Phase Distribution in Bubbly Two-Phase Flow in Vertical Ducts", International Journal of Multiphase Flow, Vol. 20 (1994), pp. 805–818. 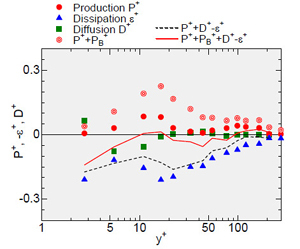 (2) Kataoka, I., Serizawa, A. and Besnard, D.C., "Prediction of Turbulence Suppression and Turbulence Modeling in Bubbly Two-Phase Flow", Nuclear Engineering and Design, Vol. 141 (1993), pp. 145–158. (3) Troshko, A.A. and Hassan, Y.A. "A Two-Equation Turbulence Model of Turbulent Bubbly Flows", International Journal of Multiphase Flow, Vol. 27 (2001), pp. 1965-2000. (4) Hosokawa, S. and Tomiyama, A., "Multi-Fluid Simulation of Turbulent Bubbly Pipe Flows", Chemical Engineering Science, Vol. 64 (2009), pp. 5308 - 5318. 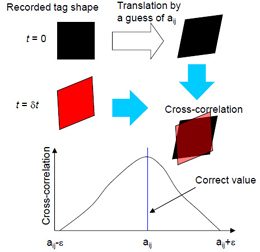 (5) Hosokawa, S. and Tomiyama, A., "Molecular Tagging Velocimetry based on Photobleaching Reaction and its Application to Flows around Single Fluid Particles", Multiphase Science and Technology, Vol. 16, Issue 4 (2004), pp. 335 - 353. 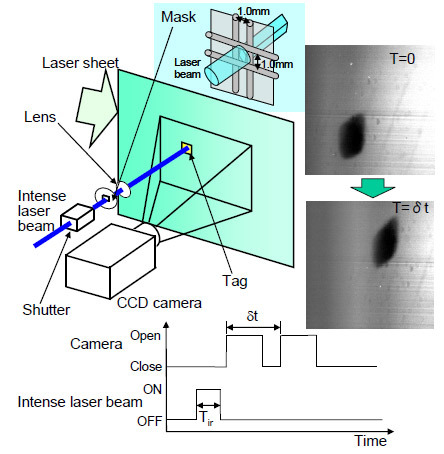 (6) Hosokawa, S., Fukunaga, T. and Tomiyama, A., "Application of Photobleaching Molecular Tagging Velocimetry to Turbulent Bubbly Flow in a Square Duct", Experiments in Fluid, Vol. 47 (2009), pp. 745 - 754. 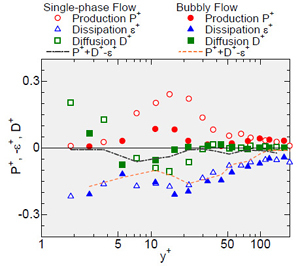 (7) Hosokawa, S. and Tomiyama, A., "Effects of Bubbles on Turbulence Properties in a Duct Flow", Multiphase Science and Technology, Vol. 22, Issue 3 (2010), pp. 211-232. (8) 水本博貴, 細川茂雄, 冨山明男, "フォトブリーチング分子タグ法による乱れエネルギ収支の評価", 日本機械学会論文集B編, Vol. 77, No. 784 (2011), pp. 2263 - 2272. 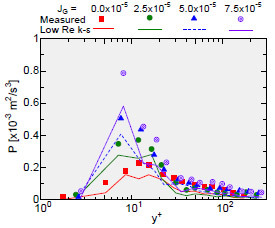 (9) Hosokawa, S., Suzuki, T. and Tomiyama, A., "Turbulence Kinetic Energy Budget in Bubbly Flows in a Vertical Duct", Experiments in Fluid, Vol. 52 (2012), pp. 719 - 728. (10) Popovich, A. T., and Hummel, R. L., “A new method for non-disturbing turbulent flow measurements very close to a wall”, Chemical Engineering Science, Vol. 22 (1967), pp. 21 – 25. 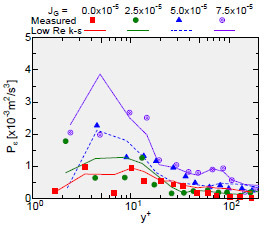 (11) Lempert, W.R., Magee, K., Ronney, P., Gee, K.R., Haugland, R.P., “Flow tagging velocimetry in incompressible flow using photo-activated nonintrusive tracking of molecular motion (PHANTOMM)”, Experiments in Fluids, Vol. 18 (1995), pp. 249-257. (12) Koochesfahani, M. M., “Molecular Tagging Velocimetry (MTV): Progress and Applications”, 30th AIAA Fluid Dynamics Conference, AIAA 99–3786. Norfolk, VA (1999). (13) Tropea, C. Yarin, A. and Foss, J. (Eds. ), Handbook of Experimental Fluid Mechanics, Springer, (2007). 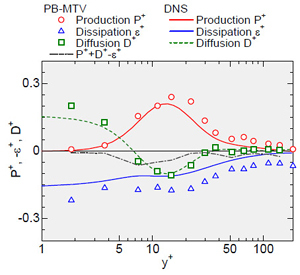 (14) Horiuti, K., "DNS Database of Turbulence and Heat Transfer. Code number: CH12_PG.WL3", http:/www.thtlab.t.u-tokyo. ac.jp/DNS/dns_database.html (参照日2013年11月10日). (15) Kataoka, I. and Serizawa, A., "Basic Equations of Turbulence in Gas-Liquid Two-Phase Flow", International Journal of Multiphase Flow, Vol. 15, No. 5 (1989), pp. 843-855.